Both Ron and I could tell our family needed a moment to breathe and find our center again. We were all moving quickly in the details of our day, and it was a great morning to jump off the tracks and have some words together. 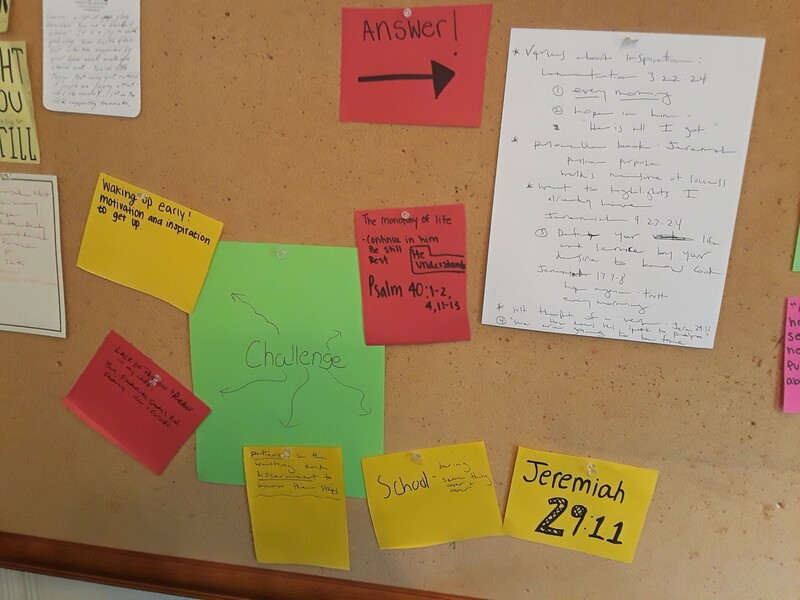 Step 1: I cut some construction paper into squares and passed one out to everyone at the table to write the answer to my one question – What is your challenge right now? We each took a minute to write, and then we shared. Step 2: Grab your Bible and scroll through the concordance for an answer that you think Father might want to tell you concerning your challenge. Find a word that gets your attention, and then find a verse. Ask: what is this telling me about my challenge and who God is in this challenge? Make a chart, draw a picture or write some words on your paper. This is how it went at our kitchen table. • Ron thought about a person in the Bible that might have something to say to him about this and thought of Jeremiah. Then, he just scrolled through the verses he had highlighted from conversations before. He found Jeremiah 9:23-24 with the answer to define your life and work by your desire to know God. He also shared Jeremiah 17:7-8 with the same idea of Ada – hoping in him, trusting, every morning. • Maya just went through the concordance and chose the word “waiting.” She found Psalm 40 and shared all of the verses as a great prayer to say “every morning.” Can you see a theme starting? • I found the word “continue” in the concordance which led me to 1 John 2:28. This verse first called me a “dear child.” I appreciate that; I think John, the writer of these verses, knows the weight of our challenges. It is a term of endearment as one who speaks in my defense. I am already taking a deep breath. Then, he counseled me to “continue in him” through each of my challenges. I looked at the verse above and below it to see if there was any more information on how to do this. Verse 27 told me that I had an anointing to help me in this continuing. I wanted to know more about this, so I looked up the word “anointing” in the concordance and found 2 Corinthians 1:21 and found that God does this. He makes us “stand firm.” He “anoints us, sets his seal on us and puts his Spirit in us” so that I can – continue in him. Last, I looked at the rest of the “continue” verses and found one in the very last chapter of the Bible – Revelation 22. In the last book of the Bible, Jesus encourages me to “continue to do right; and continue to be holy.” I remember this “continuing” is not in my strength but in the one who gives it going back to the 2 Corinthians verse which also takes me back to the first verse I read in 1 John, “and now, dear children, continue in him so that when he appears we may be confident and unashamed before him at his coming.” And so it comes, full circle! He is coming back, and he has beaten every challenge that we face. Step 3: Share what you heard, you read or you wrote. As you can see, we had a great conversation around our kitchen table and watched him weave each of our verses and conversations into one. To face the challenges, we found these answers. Just no better way to live than in his way and word! We do live in the meantime (Maya’s Psalm 40), so we rest in his endearment first – he calls us, too, dear children (Karla’s 1 John 2:28), and then we walk in our “continuing” – fueled by his “anointing” (2 Corinthians 1:21), secure in the promise “we are going to be fine” (Carson’s Jeremiah 29:11), beginning again “every morning” (Ada’s Lamentations 3:22-24) and knowing our answers are him (Ron’s Jeremiah 9:23-24). Read it again, breathe it in and continue friends.